What do you want to be able to say in your later years, that you worked yourself to death in the office or that you enjoyed time with your loved ones, creating lasting memories during the vacations you took? If it’s the former, that’s just kind of sad because the latter is where we live and love and actually enjoy our lives. Taking more time off will increase your productivity and create a stronger support team. 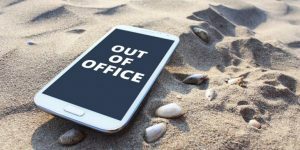 Vacations — time off — should be for leaving the office behind and relaxing, not taking the office with you. Here’s a scenario: You decide to take your family to Hawaii for vacation. You’ve got a great room with a beach view and a loose itinerary that allows for plenty of spontaneity. Sounds great, right? However, if you check your office email and return phone calls every morning, then you’re not on vacation. You’re just working remotely from a much prettier location. All the stress you left behind at the office has followed you to Hawaii, stealing time from you and your family. If you’re really, actually, positively going on vacation, then go on vacation. Your brain needs time to rest, to heal from the day-to-day grind of running your practice. My experience — personally and working with attorneys who take great time off — is that your creativity goes through the roof when you return to work. Client problems don’t seem so big, and you get a new perspective that allows you to grow your business dramatically. I could list a hundred reasons why you need to take time off, but for today I’ll give you my top three reasons. First, it’s good for you, mentally and physically. Too many lawyers are working themselves into an early grave, stressed out with high blood pressure and poor physical health. Time off allows you to shake off the stress and recharge your batteries. Investing time with the people you love can actually help you be more creative, interesting and productive than lawyers who are always in the office. Second, taking off also gives your team an opportunity to take off the training wheels. If you’re there to solve every problem — whether it’s legal or customer service — they’ll never grow beyond you. If you’re the big tree blocking the sun, growth will never occur. Taking several weeks off will empower your team to make decisions. Let them know you won’t be checking on them. My prediction is that they’ll grow and learn and expand as professionals. If you never take time away , then it robs them of this opportunity. You have to learn to trust your people. And if you can’t trust your people, you’ve got the wrong people. The third reason is that taking time off will help you see how your firm works without you. How do your systems for customer service and marketing work when you’re not directly involved in all of it? Does it wither or thrive? How is your case flow in your absence? More importantly, how’s your cash flow if you’re not the one driving it? I encourage lawyers to take at least 175 days off every year — and when I say off, I mean off. No emails, no phone calls, no “I’ll just check this one thing.” If you get interrupted, then there a system or process that needs to be fixed. When you’re on vacation, an emergency is nothing more than an opportunity for your team to figure out how to fix that problem. Empowered team members are happy, productive people — the kind you actually want in your firm. I could list another 20 or 30 reasons why you need to take time off. Instead, I encourage you to look for any opportunity to start strengthening your law firm and your capacity for joy. Expand your life and grow your firm by taking enjoyable time off. If you’re like most attorneys, at the end of a long day at the office, all you want to do is get home to your family and relax. You want to take it easy, especially at the end of a long week. All too often, however, you can’t relax. There are dishes in the sink, dirty clothes that need washing, and a carpet that looks like it hasn’t seen a vacuum in weeks. After a long day at work, you still have a long day ahead of you at home. As a law firm owner, you’ve hired and trained staff for key positions that keep your practice humming — from a receptionist to a client intake specialist, from a paralegal to a team leader for document drafting. There’s one position you might not have considered, however, that could really increase your productivity at work and the amount of quality time you spend with your family: a domestic assistant. I know what you’re thinking: There’s no way I can afford to hire someone to help manage my household errands and projects. I say there’s no way you can’t afford to hire a domestic assistant. Doing so will free up time for you to be more productive at the office and more focused when you’re spending evenings and weekends with your spouse and children. 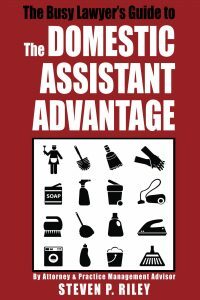 My book, The Domestic Assistant Advantage,™ can help attorneys regain control over their home lives by teaching how to find, hire and train a domestic assistant to manage household chores and errands. You’ll be less stressed at home, and when you’re able to relax you’ll find that you’re more productive and happy at the office. Why would you hire one? How can it save or make you money? You really can buy time. Hiring a domestic assistant can help you become a super lawyer and super mom, dad, wife, husband and partner. Many attorneys struggle with dedicating enough time for law firm marketing. I recently posted about holiday marketing strategies. Here are a few quick tips to help you position your practice for a great start in 2018. I think of marketing in terms of strategy. If done properly, you won’t have to worry whether you’re doing enough of it and then play catch up when you think you have fallen behind somewhere around August. Small, thoughtful moves made throughout the year can yield more than sporadic efforts without a marketing strategy. Make a plan, commit to it, but don’t overthink it. Consistency is key. Review your marketing strategy from 2017 and highlight what worked. It might be a good idea to double down on those things for the new year. It can be something as simple as writing articles on LinkedIn regularly, to setting referral goals for the month. Just be consistent. It is always best to be yourself in your marketing. If people feel like you’re being inauthentic they may not trust you to be transparent in your work. This would defeat the purpose of your practice. Your marketing efforts are an opportunity to establish trust. Stay true to yourself (your brand) across all your marketing efforts. Every client isn’t a yes. And if you’re managing your business effectively, you can put yourself in a position to say no to clients who aren’t the right fit. This will save you time and money, allowing room for your practice to grow. Yes, sometimes less is more. There are times when you simply can’t figure it out yourself. This happens to everyone. The work of transforming your practice will come from the effort you put toward your action plan. If that’s something you struggle with, then I strongly encourage you to invest an hour of your time in a Practice Growth Diagnostic™. It is simply THE most effective way to determine where the holes are in your practice and what actions you can immediately take to improve your law firm’s profitability. Your ultimate success lies in your hands. Here’s to a great 2018 and hoping it’s a transformation for you personally and professionally! The holiday season is fast approaching, and I’ll bet you’re tempted to look back over this past year with a critical eye. Whoa there. Take a deep breath. Let’s look at your goals. Acknowledge the things that went well in 2017. And, while it’s good to take note of the things that didn’t go so great (i.e. any frustrations, tolerations, or breakdowns), don’t dwell on them. Instead, use this line of thinking to propel your law firm into 2018 with momentum. 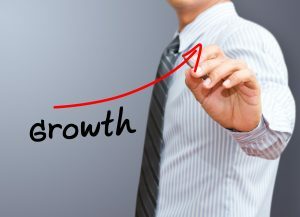 Possibly the best way to assess your practice’s past year is with an annual Practice Growth Diagnostic™ . It is the most comprehensive method to determine what is working well in your practice, what isn’t or needs attention, and how to strategize for the future. Check it out. Set your practice up to win in 2018. I’d also like to recommend a short exercise. Pull out a notepad (or use your computer or smart phone to start a new document). Write down what you consider to be your practice’s three biggest accomplishments for the past year. Under or next to each item, write down the top three actions taken that generated this great result. Is there anyone you should acknowledge who helped make these achievements happen? Probably, right? Make a note on your January calendar to speak with each person (not email!) to express your gratitude for their part in these successes. Next, list all the little things you tolerated the past year. These could include staffing issues, daily interruptions, failing to find time for marketing, or hanging on to a troublesome client that you know you should have let go. As you write this, you will begin to see some of the small – but draining – matters that sapped energy from your practice. The first step to addressing these kinds of distractions is acknowledging they exist. The second step is to choose at least one of these “tolerations” you’ve been putting up with that you’re annoyed enough about that you’ll commit to eliminating it by taking a specific action by a set deadline. Are you willing to commit to getting rid of more than just one? Finally, write down the goals you’d like to accomplish in 2018 both personally and financially. Give this part of the exercise some time, and don’t worry about making it perfect in one sitting. This is going to be a “living document” you can refer to throughout the year, making additions and subtractions as needed. These goals are the foundation of your 2018 action plan! Include the first action steps will you take to move towards achieving your personal and financial goals. If you feel like this is an area where you could use some reinforcement, please contact Atticus.